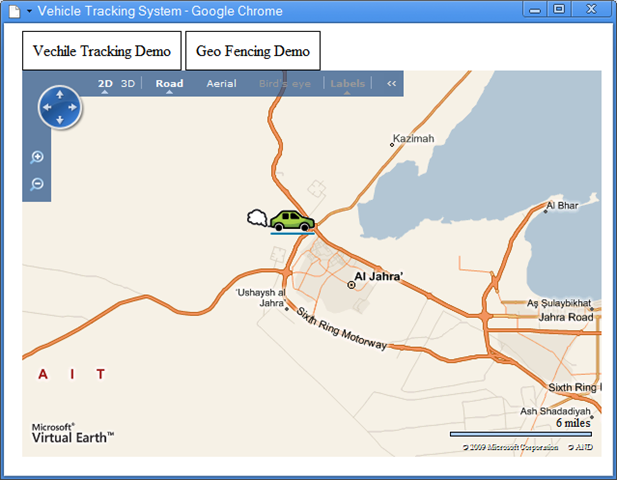 Today, I had to build a sample demo using Microsoft Virtual Earth to simulate vehicle tracking and geo fencing. The term geo fencing was a little bit new to me, you can have a look here for more details. My sample here consists of two parts, one is the live tracking of moving objects based on geospatial data [Longitude, Latitude], and the second part is about geo fencing a moving object to a limited geographic area. During my research on how to calculate geospatial data for a specific point on the map, I came across the following sample which helped me a lot to get the test data for my sample. As you see all the test data I got it from the Location Chooser sample. The next screen shot shows a moving vechile that suppose to not cross a specific boundary. 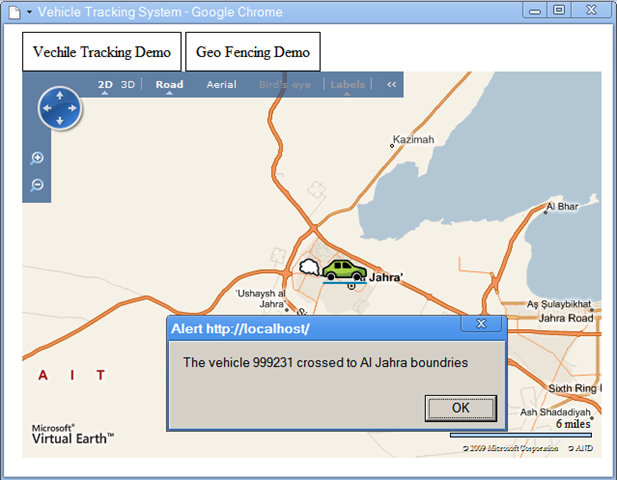 When the car cross that boundary which is [Al Jahra] boundary, an alert appears to the user to tell about that error. 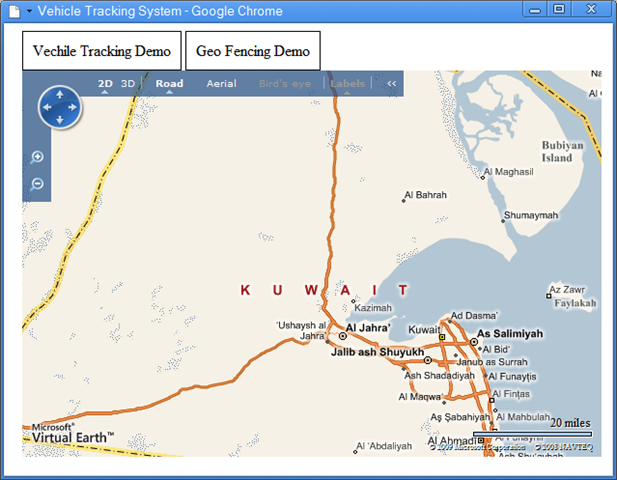 We can use the sample basics to provide a near real time tracking for any moving objects. The objects itself must use some technique like GPS to tell the application about its current location. I’m working now on some more advanced geo fencing techniques using Microsoft Virtual Earth and ArcGIS, I’ll post about it soon. awesome coding.. could you pls let me know how can I get lat long value from database/webservice in realtime vehicle tracking.. Please guide me if possible.. This can be done using a web service or http handler that returns JSON. It’s based on ASP.NET AJAX 4.0 but the only deference is with the client templates. If you need a working sample on ASP.NET AJAX 1.0 JSON, please let me know. Its only displaying the map not more than that…. Please Can you help me for it…..